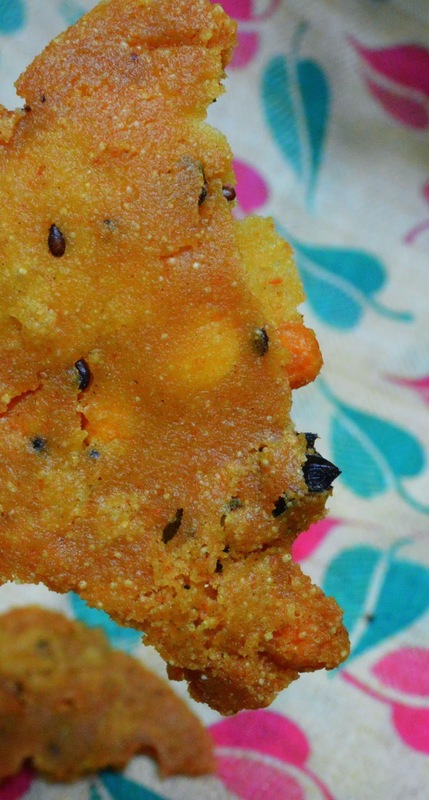 Thattai is a traditional south Indian recipe which is made out of rice flour. I have been thinking for a while to make thattai with siruthaniyangal/millets and so started off with Thinai (Foxtail millet) flour. To my surprise I got crispy tasty thattais. It was so yummy that we couldn't control ourselves from munching more and more thattaisssssss. 1) Soak Channa dal in water for 1 hour. 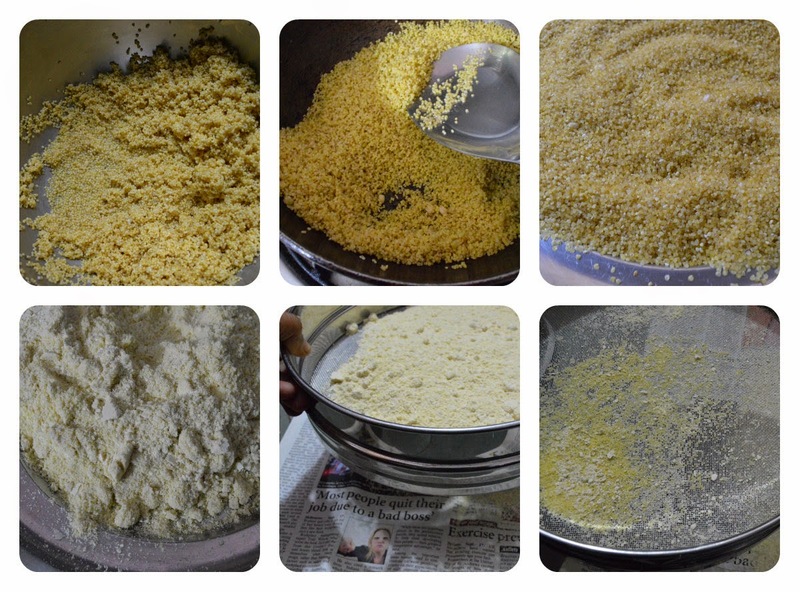 2) * Wash and soak thinai (Foxtail millet) for 15 mins and spread it on a cotton cloth to dry. Heat a kadai and dry roast this thinai in medium flame for 10 mins and let it cool down. After it cools, grind it using mixer to fine powder. You can also grind it in a flour mill. Sieve this powder to remove the rava part. Keep this thinai flour for thattai. mixer to fine powder. Sieve this powder and store it. 4) If you are using Asafoetida powder, you can add it directly. In case, you are using bar asafoetida soak it in 1 tbsp of water for half hour. It will get dissolved in water and you can use this water for preparing thattai dough. 1) Take a bowl and add Thinai flour, Urad dal flour, Butter, Channa Dal, Turmeric powder, Red chilli powder, Sesame seeds, Chopped curry leaves, Asafoetida and Salt. Mix them and knead them by adding water. 2) Make sure to sprinkle water little by little and make a tight dough. 3) Make equal sized balls and close it with a cotton cloth. The balls will become dry and that's why we are closing it. 4) Heat oil in a kadai in medium flame. 6) Take a plastic sheet or banana leaf and spply some oil on it. Keep one ball on it and close with another plastic sheet/Banana leaf. Press it with a flat bottom vessel or cup. 7) Poke the thattai with fork and slide it to oil. 8) Let it cook one side and flip around to cook for other side. 9) Once both the sides are cooked, remove from oil to serve. This thattai can be stored in airtight container and stays crispy for longer days. Also this 1/2 cup millet flour gave me 6-7 thattais. 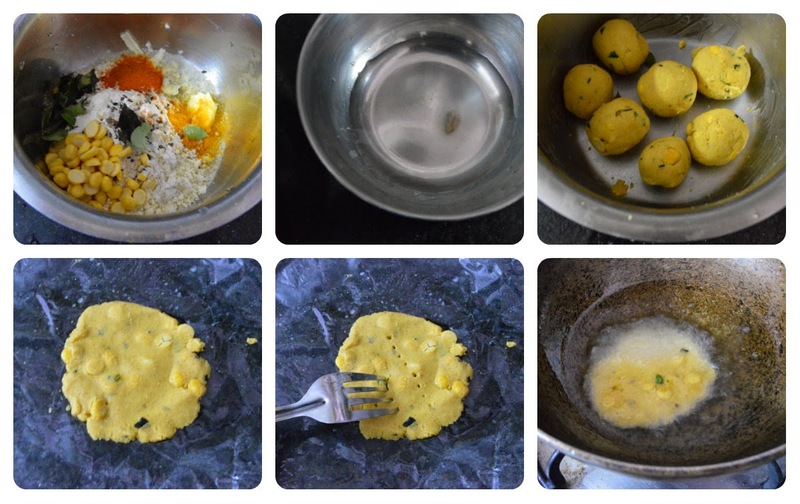 1) You can add pottukadalai (fried gram) instead of soaked channa dal. 2) Garlic paste can be added for a different flavour. 3) Roasted peanuts (Skin removed and split into halves) can also be added. 4) Grated coconut or thinly chopped pieces of coconut can also be added. 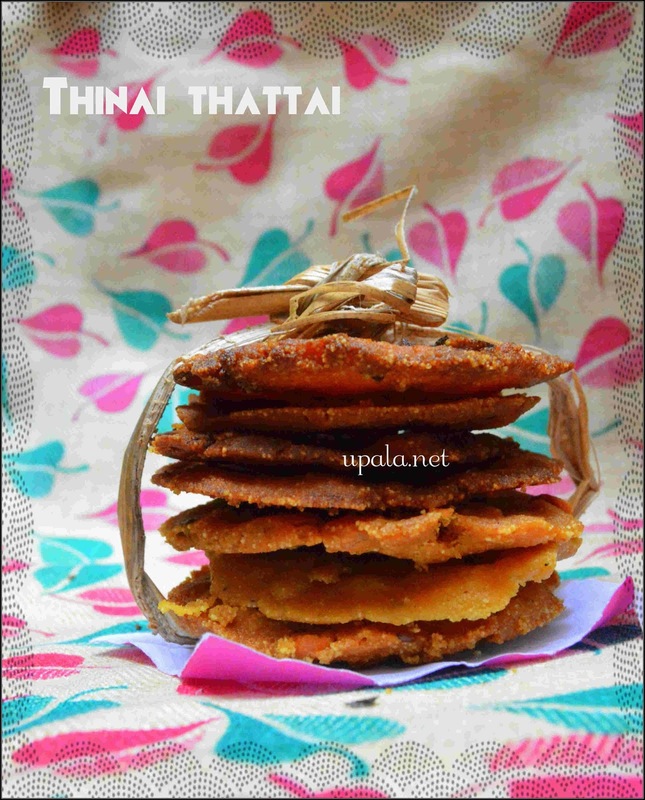 Try these thinai thattai with what ever variations you like.